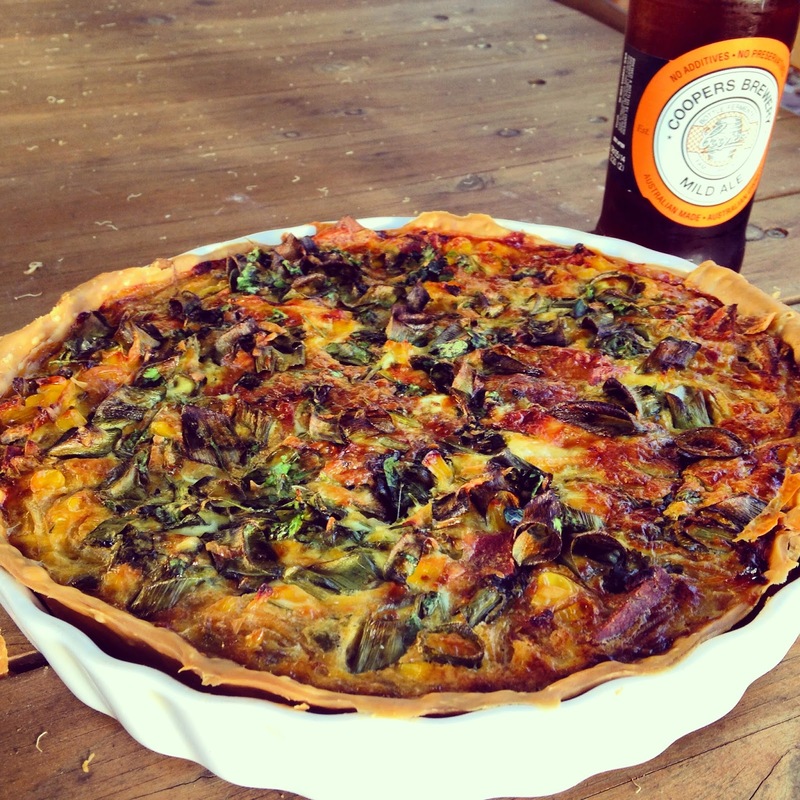 This is not your normal girlie, pedestrian quiche that most people try and cook, this is a man’s quiche, it’s got balls, in fact it’s got fiery balls and kicks like a mule. So put your man pants on and cook this beauty to impress your friends and show them that a quiche doesn’t have to have a girls name or even feature spinach. 1 tsp Taco seasoning or Mexican seasoning. 4 strips of Sanitarium bacon style Rashers roughly chopped. 50 g Grated Parmesan cheese. Grease a quiche or pie dish with butter and lay the pastry over so it covers the base, the sides and little overlaps the edges. Throw the rest to the chickens, they love that stuff. Prick the base with a fork and bake for 10 to 15 minutes until nearly golden. (I don’t bother loading up the base with chickpeas or beans to weight it down as the filling will weight it down anyway and it’s too much stuffing around) Remove from oven when done. While the base is cooking, sauté the sliced onions in butter til almost soft. Mix in the cumin, Taco seasoning, corn, pepper and soy rashers and cook for another 5 or so minutes. Beat the eggs with the milk and then add some salt, the grated parmesan, the spring onions and coriander and mix well. Pour the onion and corn mixture into the base of the pastry and then sprinkle with the cheddar. Pour the egg mixture on the top and using a fork gently work some of it through the onions, but not too much. You still want the top to be light and fluffy. Bake for 50 or so minutes. Serve warm or cold. Goes well with a chilled white wine like an bakkheia Wines Different Drummer Fume Sauvignon Banc. or an ice cold beer.